Firefighters respond to a fire at a home on Guiness Avenue in Rexdale Monday April 15, 2019. 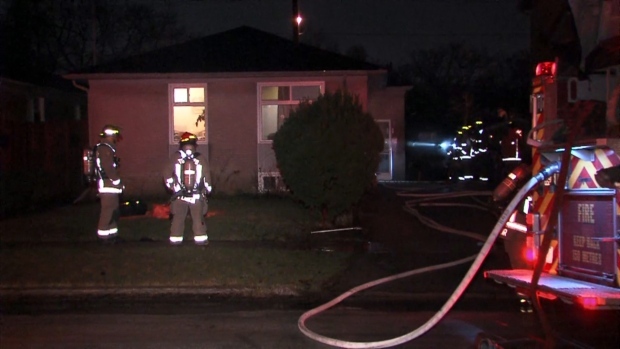 No injuries were reported after a fire broke out at a home in Rexdale overnight. Fire crews were called to a detached home on Guiness Avenue, in the area of Martin Grove Road and Westhumber Boulevard, at around 1:25 a.m.
Crews arrived to find visible smoke at the home. The fire was traced to a stove in the basement and firefighters were able to stamp it out quickly. All of the occupants of the home made it out safely, Toronto Fire said. There’s no word on the extent of the damage.